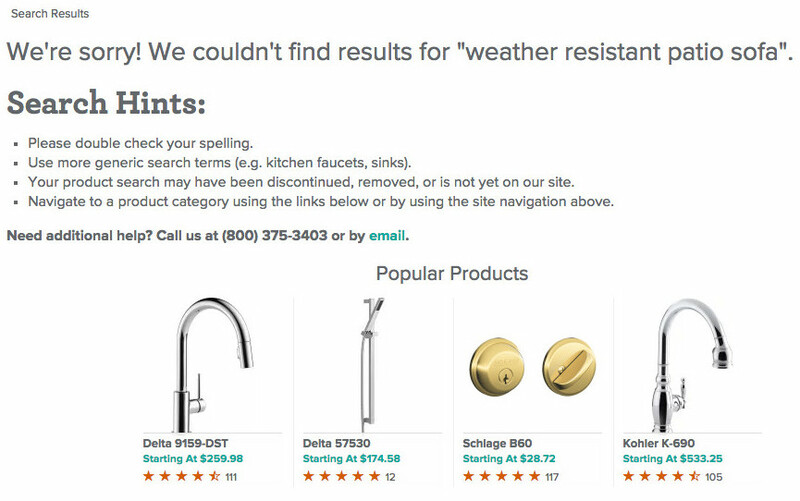 During our large-scale Search usability testing, many users at some point encountered a “No Results” page as they searched for products. Reaching a “No Results” page isn’t necessarily a serious issue, except when the “No Results” page offers few or no paths for users to get back on track — making it a UX dead end. Our testing reveals 6 essential elements that can prevent the “No Results” page from being a dead end and instead guide users towards better product-finding paths — keeping your users on your site. However, our UX benchmarking also shows that 45% of e-commerce sites fail to provide enough of these 6 essential elements to help users recover from a search query that yields no results — which will often be a direct cause of site abandonments. At some point, even the best search engines will be unable to produce results for a given user query. Sometimes the site doesn’t have what the user is looking for, or the user’s query is so cryptic that not even the best search engine will be able to yield relevant results for it. 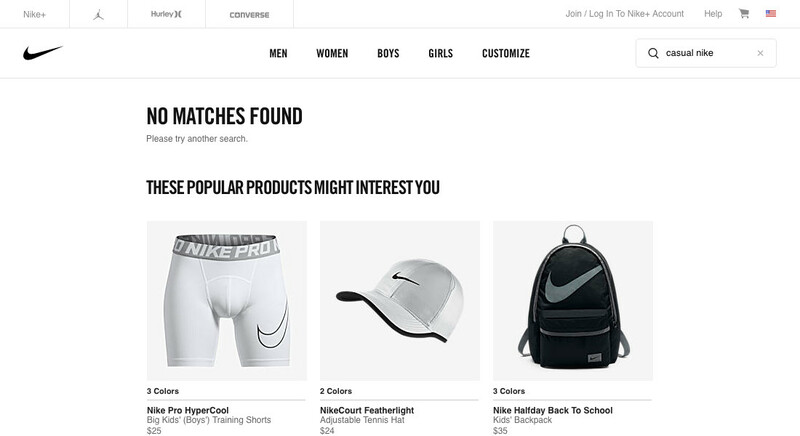 On Nike, there are likely products that could have been returned for a feature search, “casual nike”. 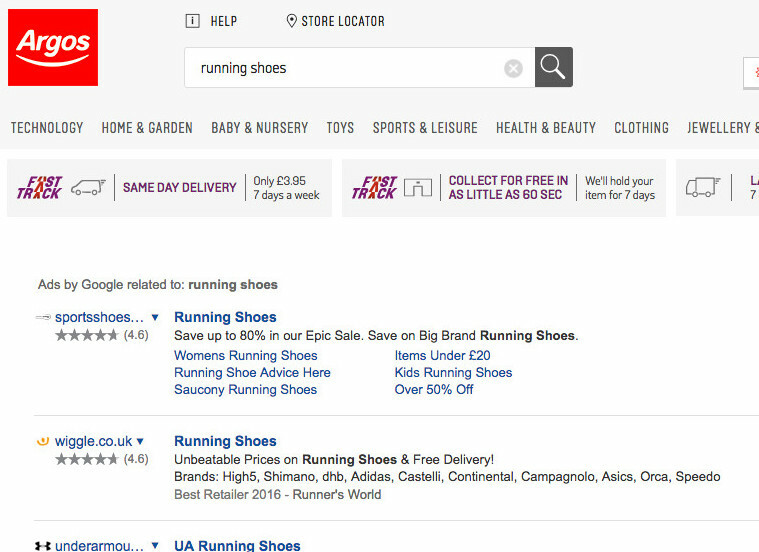 In any case, the “No Results” page essentially leaves users at a dead end, as it only provides a few promoted products to consider. 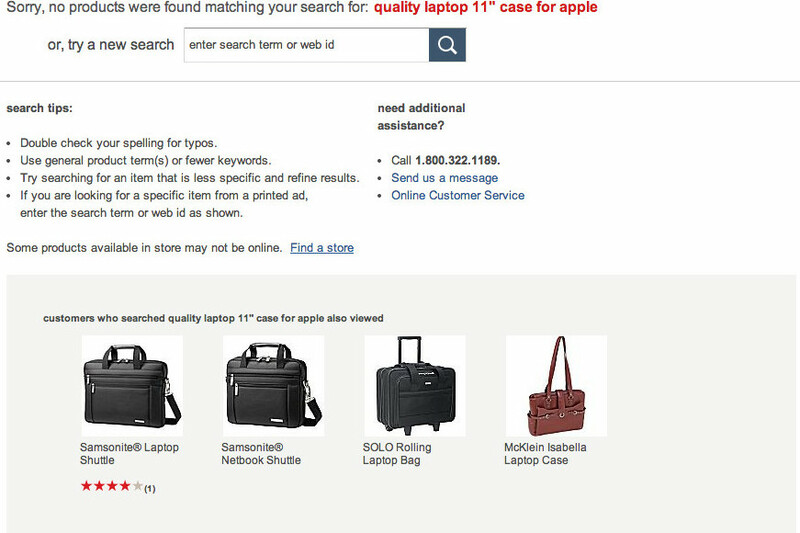 Then there’s the common scenario that the search engine doesn’t fully support or understand one of the 12 types of queries that users often search by in e-commerce — a topic we’ve covered extensively in our article Deconstructing E-Commerce Search: The 12 Query Types. However, there’s good news too: on the opposite end of the spectrum, we also observed in testing that great “No Results” pages — which take users by the hand and point them toward meaningful content and solutions — can become an enabler rather than a roadblock. The “No Results” page is, in other words, not a problematic page in and of itself — but its implementation is hugely important and can lead to anything from an abandonment to a user eventually finding a product they were looking for and completing a purchase. Yet during benchmarking we find that 45% of e-commerce sites have a problematic “No Results” page implementation that’s bound to cause issues for their users. Tips on how users can “improve” their search query (seen here at Cabela’s), such as checking for typos, trying different words, broadening the query by removing certain keywords, etc. are better than nothing at all, but they still put all the work on the user’s shoulders — users must think up a new search query. If search tips are the only help provided to users on a “No Results” page many users are still likely to be at a dead end. Our testing and benchmark reveal that many sites offer “search tips” on “No Results” pages. While the intent behind providing search tips may be fair, in practice we observe users rarely read or make use of such tips. Even those users who do read the tips may still be stuck — they may not know which term is misspelled, or what the site’s preferred “alternate” term may be. Other users simply don’t want to spend the time to read through the tips, consider how to change their query, then try again — with no assurance that their new query will be successful. Search tips aren’t “enough” by themselves — they can be provided in addition to most of the below essential elements, but shouldn’t be the only help users find on a “No Results” page. When users arrive at a “No Results” page, they’re already in the midst of a disappointing search experience. Our testing revealed, however, that providing most or all of the below 6 essential elements on “No Results” pages helps get users back on track. 1) Category suggestions. Suggesting one or more categories that the user may try out, which should be based on the user’s search query. 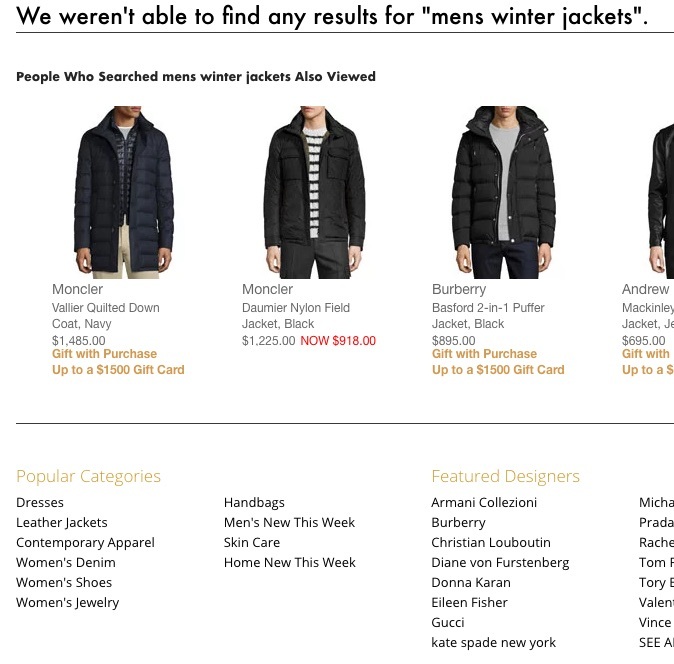 For example, if the user searches for “red winter jackets”, but the site doesn’t carry any winter jackets in red, a link to the “jackets” category may be suggested (or, even better, a link to a product list of “jackets” with the “winter” filter pre-applied). 2) Alternate queries. If the search engine has identified related queries that would yield results, these can be recommended, especially in the instances where the user has submitted a highly specific query and the logic for the alternate queries can be just suggesting removing keywords. While it’s true that users themselves could also just remove these keywords, we find that users are reluctant to do so as they won’t know if that will just lead to a new “No Results” page. The e-commerce site, on the other hand, can perform the “query permutation” searches behind the scenes, and suggest query simplifications that will lead to results. Ideally, a preview of the top 3–5 results for each query is displayed so the user can get a feel for the type of products found there. If only one alternate query has been identified, it should be auto-selected with a notice on the results page stating that no results were available for the original query but the site did find results for this alternate search. 3) Personalized recommendations. 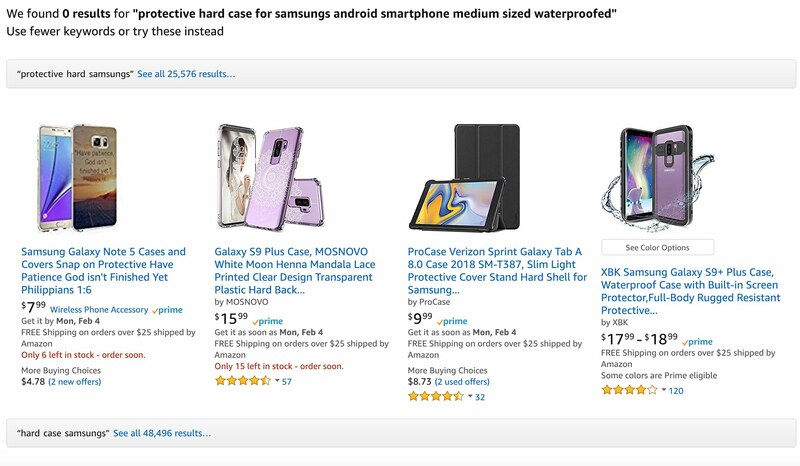 Product recommendations based on the user’s browsing history and shopping behavior may not help users find the products they were searching for, but it can be an effective way of pointing them towards other content they may be interested in. For example, even if a user gives up on finding that obscure 1920s black-and-white silent film he was searching for on your site, that doesn’t have to be the end of the visit, as you can recommend picking up one of those poetry books he was looking at earlier in a “Recently Viewed Products” section. 4) Phone number to sales, a chat feature, and other help links. Some sites have a sales representatives call center, chat feature, or other customer service available. If that’s the case, then be sure to include the phone number to sales and links to other help on the “No Results” page so users can get support in finding the products they are looking for. Some sites may worry about promoting the direct number to customer support on a “No Results” page; however, users on the “No Results” page are in a high-risk group of abandoning the site. 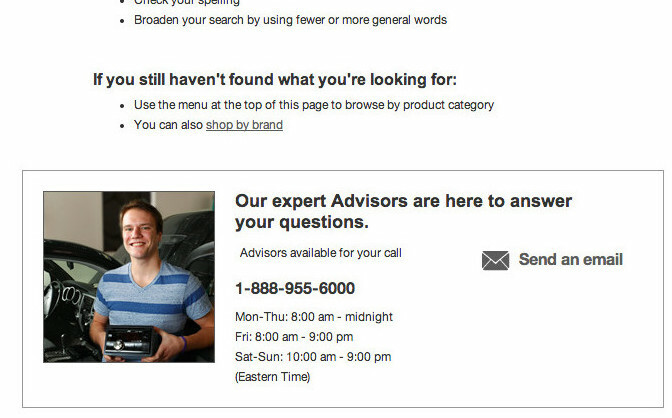 Thus, even if you’d (for whatever reason) not want to overly promote the direct phone number to Customer Support, it’s typically justified to display the direct phone number to customer or sales support on the “No Results” page (instead of hiding it behind a generic link to your support section) to encourage users to reach out. An option to open chat directly from the “No Results” page could be considered as well, as we’ve observed some users are more likely to engage with chat compared to calling customer support. 5) Ads. Contextual ads based on the user’s search query can be a decent option under some specific circumstances. If the search engine is good and supports most or all Query Types, then a “No Results” page means there’s a very high likelihood that the site simply doesn’t carry the product the user is searching for. In these cases it can make sense to display external contextual text ads (but again, only if the search engine is truely good). 6) Popular products and categories. A last resort is to link to any highly popular content, such as the most popular products and categories on the site. Since they are based on popularity, they won’t have any relevance to the user’s search or history with the site, but it at least reminds users that they may want to pick up other products on your site and makes it easy for them to do so. 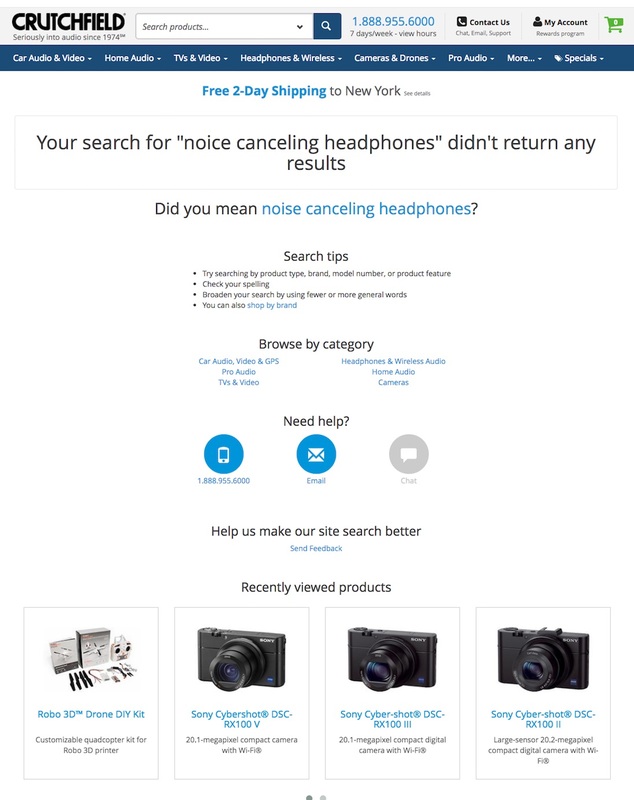 Crutchfield’s “No Results” page offers 4 of the 6 essential elements: an alternate query, related categories, links to get help, and personalized recommendations — making it more likely users will be able to find a suitable product. “No Results” pages don’t have to be dead ends. Including most, if not all, of the 6 elements above will help ensure a “No Results” page isn’t a stopping point or reason to abandon but rather a bridge to continuing a product search. Yet 45% of sites don’t offer a combination of just half of the 6 essential elements for the “No Results” page. Tip: you can also see 110 different “No Results” page implementations from top-grossing e-commerce sites in our Page Design tool. Authored by Edward Scott. Published on February 4, 2019.